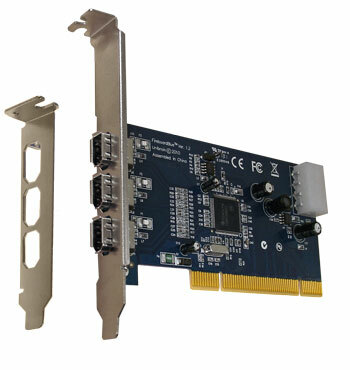 FireBoard Blue™ is a 3-port, single chip, OHCI-compliant 1394/FireWire® host adapter that provides plug ‘n’ play connectivity for FireWire devices and peripherals. Latest generation Texas Instruments TSB43AB23, integrated 1394 PHY/Link Controller. 3 FireWire ports with 100, 200 and 400 Mbps throughput. OHCI compliant/Compatible with any FireWire device or peripheral. 4 isochronous transmit/receive DMA channels. One 2m (3.3 feet) 6p to 6p Firewire-400 cable. 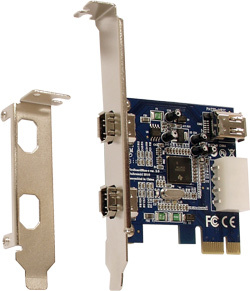 FireboardBlue-e is a 2 port, single chip, OHCI compliant 1394a PCI express adapter that provides plug ‘n’ play connectivity for FireWire devices and peripherals.